I will offer you an extremely easy and fast strawberry cake. I guarantee that it will be ready for 1 hour with stirring, baking and stacking. Light and delicious it can save you when you do not have time for a more sophisticated dessert and the guests are knocking on the door . To organize your time better I will tell you how I do it: first I include the oven. While it’s warming it mixes the dough for swamps, which takes much less time than the oven’s heating. While the dough is baked (this is about 20-25min. ), Shred the creams, mix them and clean the strawberries. The baked blatt also cools for about 20 minutes. Well, you’re ready. You cut it, grease, stick it. There are no decorations to delay you, and the cake is ready for consumption immediately, it is not necessary to mature in the fridge like most cakes. So … you have a wonderful dessert for only an hour. Fresh, tasty and light, it’s a much better solution than going to the confectionery and buying another cup of cake. Homemade food is always preferred. It’s really fast, try. Preparation. Beat the egg with the sugar, add the butter, then the yogurt and finally the baking powder and the vanilla. Bake the dough in a cake form covered with baking paper in a preheated 180 * oven. Once the marsh has cooled, divide it into two horizontal parts. If you have more time bake the dough on two separate swamps. This becomes equal and there is no danger of breaking when cutting. Beat the cream of snow and pudding according to the instructions on the package. Mix the two creams carefully. If you do not find it sweet enough add a little sugar. A little remark here on my part: when I mix a cream with a whipped cream, I always leave it thick enough to not be diluted with the cream but only to become light and fluffy. In this case I break the pudding with less milk than it says on the package. I add it to the eye. When I like the density of the cream I stop to pour milk. Remember that the cream will very easily dissolve, but to thicken again no way. Yet, there is a way. Just buy another pudding and add a little dry mixture to the cream that seemed to you a little. So until you get the density you want. Smash one mash with half of the cream, roll whole strawberries and cover with the other blade. 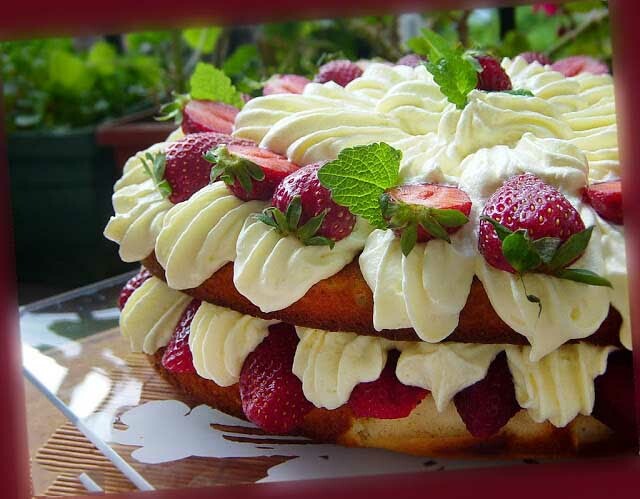 Spray the rest of the cream on top and decorate with strawberries and leaflets mint or basil for freshness. If you want the sweets to be more juicy, syrup the marsh with fresh milk.